Freshly updated for this year's Spring collection, the Alpinestars T-GP Plus R v2 Air builds upon the very successful platform of the T-GP Plus R Jackets. 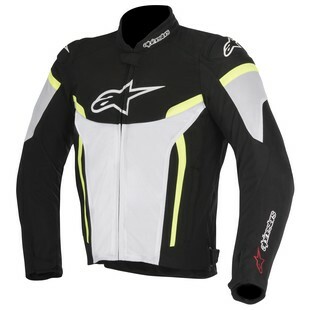 That is right folks, this is the Alpinestars T-GP Plus R v2 Air Jacket. Try to say that five times fast! The most notable improvement over the previous iteration of this jacket is first and foremost the restyling. Alpinestars decided to ditch some of the raised foam padding throughout the jacket and tone down the branding a bit leaving an overall cleaner appearance. Working off of this idea of refinement they have also trimmed some of the bulk out of the collar and made a switch from accordion poly-fabric stretch at the shoulders to standard poly-fabric stretch. In my opinion it looks and functions a bit better. Finally, they added TPU hard parts to the shoulders covered in a layer of textile improving the overall impact protection and sporty aesthetics. All together, the slight changes improve this already great platform and I think the added shoulder protection warrants the $10 price increase over last year's model. At $239.95 the Alpinestars T-GP Plus R v2 Air checks all of the boxes for a protective and well priced summer weight jacket.